This week we have a good mix of articles about growing startups from people you may have heard about - Casey Winters, Guillaume Cabane, Hiten Shah and Andrew Chen. 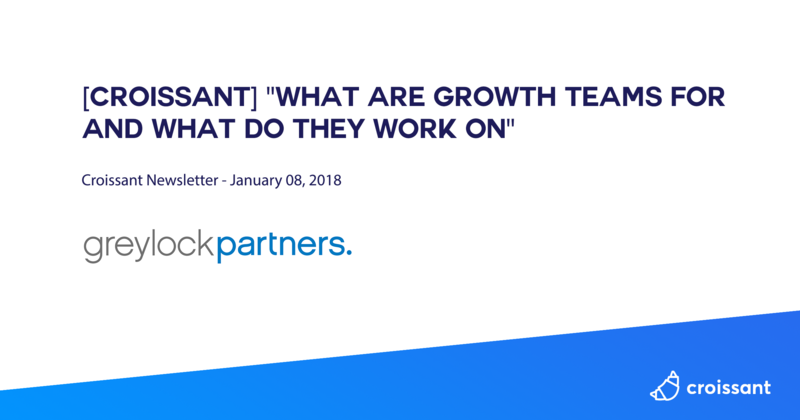 "I receive a lot of questions about growth teams. Naturally, there is a lot of confusion. Is this marketing being re-branded? Who does this team report to? What is the goal of it? What do they actually work on? When do I start a growth team for my business? The purpose of growth is to scale the usage of a product that has product-market fit. You do this by building a playbook on how to scale the usage of a product. A playbook can also be called a growth model or a loop. What changed is an acknowledgment of what actually drives startup growth. There are three main levers. Phase I is simultaneously the most important and the least understood. In Phase I, you change the product to increase its growth rate. The other two phases are what we traditionally think of as marketing." 4 - How to Deliver a Better Experience to Your Visitors (And Increase Conversions in the Process)"
3 - Doubled down on freemium distribution and horizontal use-cases in their recent acquisitions to make the top of their funnel even wider across teams"
"One of the concepts that struck me was the depth of engagement. It shows you how engaged different portions of your user base are. You don’t need a ton of fancy data science techniques to get a glimpse into what your user base is doing. All you need a fairly straightforward SQL query to get you started. It starts with a fairly simple concept: how many users are active for 1 day in the past month? How many are active for 2 days in the month?" "When a potential customer wants a demo of Livestorm's webinar capabilities, naturally, Livestorm hosts a webinar. The real magic starts once the attendee signs up for a demo. The Livestorm team built a multi-step Zap—our term for a bridge between two or more apps—to take the registrants' information and turn them into leads. That's a simple enough process. Livestorm gets more in depth by adding data-enriching program Clearbit into the Zap. Clearbit looks up customer and company information by email address. It'll find social media pages for the company, industry, attendee's department, and more—if you need it, there's a good chance Clearbit will find it." "When I joined Netflix as VP of Product in 2005, I wanted to do more. My goal was to help a young company establish a world-class product and brand. As a product leader, my job was to delight customers in hard-to-copy, margin-enhancing ways. Based on experience, I viewed building a brand as one of the most important of these “hard-to-copy” tactics. By the time I joined Netflix, I had a somewhat nuanced view of how marketing and product should work together: marketing defines the brand and product brings the brand to life by building a great product. Together, the two teams hope to create a world-class brand and product." "1 - Titles are 80% of the work, but you write it as the very last thing. It has to be a compelling opinion or important learning. 5 - Focus on writing freq over anything else. Schedule it. Don’t worry about building an immediate audience. Focus on the intrinsic. 7 - Most of my writing comes from talking/reading deciding I strongly agree or disagree. These opinions become titles. Titles become essays. 11 - Publishing ideas, learnings, opinions, for years & years is a great way to give. And you’ll figure out how to capture value later"